Container gardening is a great way to get fresh food in a small amount of space. You can grow an almost endless array of veggies from salad greens to tomatoes to—believe it or not—some varieties of corn. 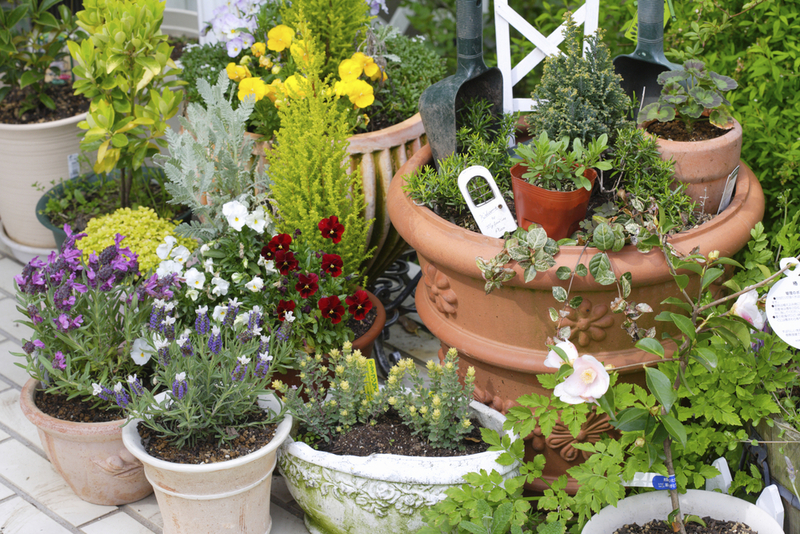 Here are some tips on how to get the most out of your container garden. Although you can plant a bit closer than normal when you’re creating a container garden, you don’t want to crowd those plants together. Overcrowding will lead to weak and spindly plants. In the long run, one tomato plant in a big pot will give you more tomatoes than four plants in the same pot. 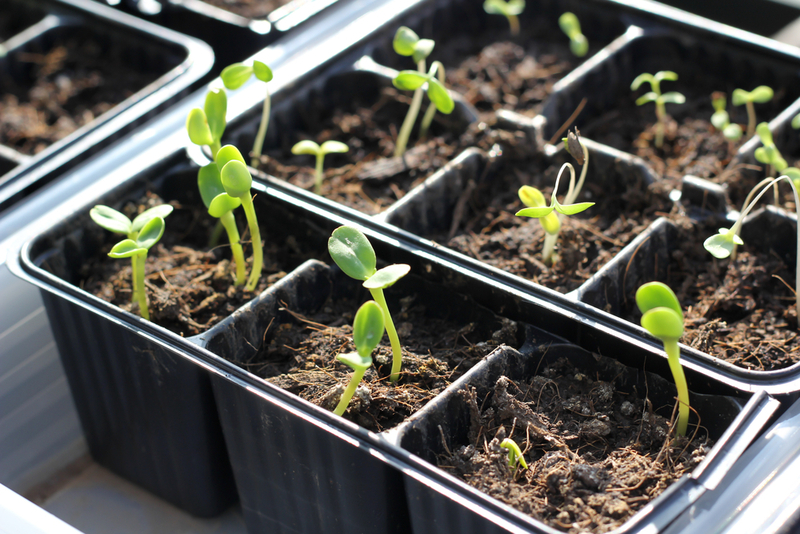 If you’re growing sunflowers or corn, for example, you’ll want a larger container. The same goes for any plant that will grow tall or bushy. If your veggies are going to bear heavy fruit, you’ll want your container to be heavy enough not to tip over under the weight. Plants that grow in containers don’t get to benefit from the natural moisture to be found in soil, so they dry out quickly. They’ll need regular watering to ensure healthy growth, so don’t let the soil dry out completely between waterings. 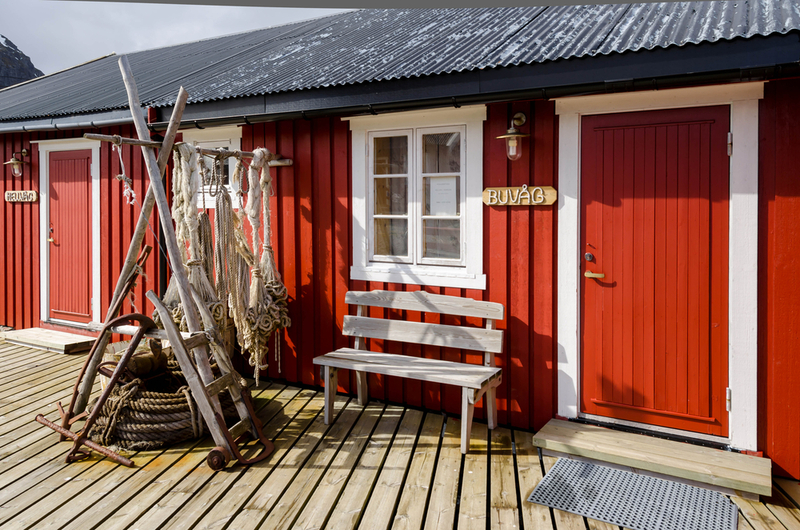 On the other hand, don’t overwater, as that can lead to rot or mold. Create a watering schedule and stick to it. Also, be sure your pots have plenty of good drainage so the roots don’t rot. Container plants, especially varieties like tomatoes and sunflowers, need lots of sun. If your balcony only gets partial sunshine, stick to herbs and salad greens, which do well without lots of direct sunlight. 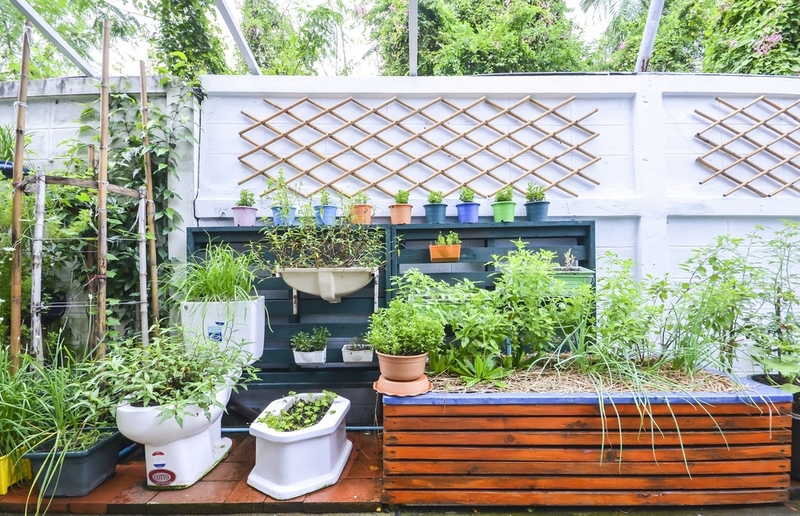 Rooftops can be windy, so if your container garden is on a roof, set up a windbreak to keep your more delicate plants from blowing away or your pots from tipping over. Make sure the windbreak doesn’t cast shade, though. Lattice is a good choice. Also, place your pots close together so they brace each other. All plants need good nutrition, but it’s even more important for container gardens. Use a light potting soil and mix in some nutrient-rich compost. Fruiting plants such as tomatoes need more soil and more nutrients in order to have optimal flavor and nutritional value, so be sure to factor that in when you’re putting your garden together. If you’re succession planting—in other words, you’re planting and harvesting things like salad greens all summer—make sure you add extra compost and nutrients between plantings. Do you have any other container gardening tips? Please share them in the comments! You know spring is finally on the way when the first crocuses start poking their heads out through the snow. Those small purple flowers bring a smile to any Northeasterner’s heart. Here are some facts about and tips for growing crocuses in your own garden. The word “crocus” is Latin for “saffron.” The three stigmas (female reproductive organs) and part of its style (the stalk connecting the stigmas to the rest of the plant) are often dried and used in cooking for seasoning and coloring. But it takes thousands of crocuses to get just one ounce of saffron, which makes it the world’s most expensive spice by weight. The crocus that produces saffron is an autumn-blooming variety with the Latin name Crocus sativus. The famous winter-blooming crocus is called the Snow Crocus, or Crocus chrysanthus. Crocuses are native to and were first cultivated in southern Europe, near Greece. They are also common in Asia. There are approximately 80 species of crocus, only about 30 of which are cultivated. Since crocuses start as bulbs—or more accurately, corms—they need to be planted in the fall. They should be planted in areas where they will get a lot of light, especially in those early months of the year when the days are still short. Crocuses prefer sandy, well-drained soil. Experts recommend planting them in rock gardens or herb gardens, and surrounding them with small perennials such as creeping phlox. 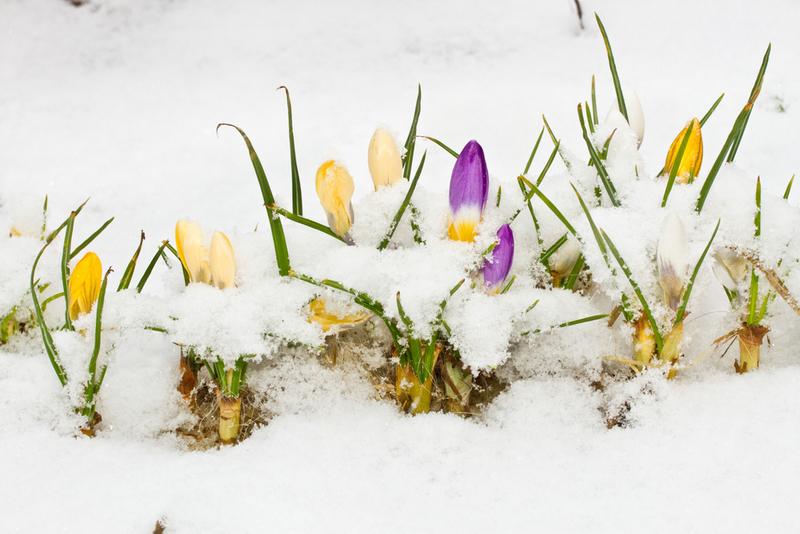 Snow crocuses do best in cold to moderate winter conditions (climate hardiness zones 3 to 7). They won’t grow in warmer climates. Crocus corms get used completely in the process of growing, and just before they go dormant, crocuses make a number of new corms, keeping the plants going for the next year … as long as they’re not stolen by hungry critters. Do you have crocuses growing in your garden or balcony? Was it easy or hard to get them blooming? Do you have anything else to say about crocuses? Please share your thoughts in the comments. In the last 10 or 15 years, there’s been a definite increase in the number of active urban gardens in the United States. Whether on a city rooftop or a vacant plot of land, urban gardens do more than just make the city a little greener: they reduce the energy used to transport food, cut down on harmful runoff, and increase the shade available to counteract the heat island effect. “Eating local” via this kind of gardening has moved beyond a fad and into a serious way to both protect the environment and provide food for our ever-increasing population. Of course, it’s not all sunshine and arugula. Urban gardens can cause the cost of city real estate to skyrocket as a neighborhood gentrifies. Urban soil can have lead, arsenic, and other toxins in it. And the lack of space available means these gardens are often squashed into tiny plots that give off limited yields. But technology is advancing the cause, and interest in urban gardening continues as we enter 2017. In fact, it’s even gone commercial. The rooftop garden on the InterContinental New York Barclay Hotel, for instance, provides herbs, honey, and produce for the hotel kitchen. Currently home to about 900 urban gardens—many on the same scale as the Barclay Hotel’s–New York City is quite possibly the birth place of the urban gardening craze. Another well-known example is Annie Novak’s Eagle Street Rooftop Farm, arguably the first commercial urban garden. Eagle Street opened seven years ago on the roof above the soundstage where Master of None and The Unbreakable Kimmy Schmidt are filmed. Novak’s garden is extensive, with blackberries, lavender, basil, sage, kale, broccoli, zinnias, and three types of English rose—among many other plants both pretty and edible. Novak says she started her garden to lower the environmental cost of carbon-intensive farming, to provide fresh produce to poor communities, and to provide food education in urban areas. And she’s not the only one getting into the gardening groove. Former professional basketball player Will Allen won a MacArthur fellowship in 2008 for his Milwaukee-based Growing Power farm, and Ron Finley, Los Angeles’s “Gangsta Gardener,” grows banana trees and sunflowers in the area’s traffic medians. Austin, Seattle, Minneapolis, Milwaukee, Detroit, and Chicago all have zoning codes, tax breaks, and other financial rules in place to encourage more urban gardens to bloom. With luck—and an increasing amount of interest and applicable technology and legal benefits—urban gardening will continue to flourish in cities all over the US. Urbanization has long driven change in human societies, but it also has an impact on plants and animals too, and not just in taking away land for their use. Other organisms that live in cities have been evolving way to cope with the concrete jungle just as they would the regular jungle. While it’s obvious that birds and rats have adapted to city life, there are much more subtle changes too. The common white clover grows all over the place, and it has an interesting defense against herbivores: it releases poison when crushed to keep herbivores from eating it. But when the plants freeze, this same poison can harm them, so plants in colder climates make less of it. 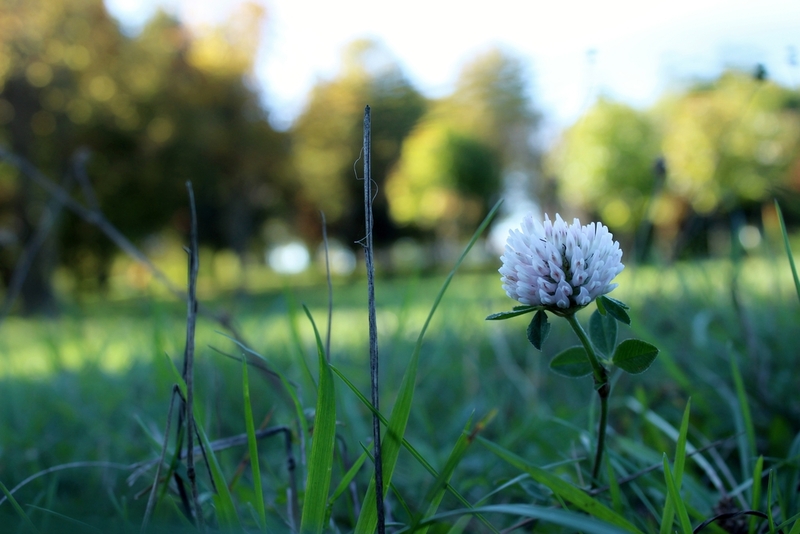 Because we know that cities are warmer than surrounding areas, scientists figured that urban white clovers would have less poison, but they found the opposite to be true. What happens is that snow, which generally falls more and sticks around longer in rural environments, insulates the ground, so that plants under snow are actually warmer than those exposed to air. So while air temperatures in cities are warmer than those of rural areas, the ground is actually much colder. Scientists have begun referring to this as the “urban cold island effect.” That cold means the clovers are more prone to freezing and they have less poison as a result. While this is a pretty amazing discovery and certainly interesting, it’s not going to “change the world” all that much. But science isn’t all Earth-shaking discovery, a lot of it is building upon other information to gradually discover something huge. What the white clover is telling us, though, is that there is a lot we don’t know about urban ecosystems and climates that can impact the evolution of organisms in urban environments. And it tells us that there are probably better ways to manage climates and ecosystems in urban environments to improve the lives of all organisms there, human or otherwise. Let’s face it: there isn’t much space in the big city for gardening. But that doesn’t mean you can’t add a little green to your life! Container gardening was made for city dwellers. You can have great success—not to mention some fresh, tasty treats—if you make some good choices about how you’ll house your new plant friends. Here are some tips. Size matters. If the pot is too small, the plant won’t produce as much, and it’ll be harder to keep it alive. If it’s too big, you’ll end up spending much more on soil than you need to. Your local gardening store can point you in the right direction based on what you want to grow and how much room it will need. Height and width. Not all pots need to be round and tall. Plants with more shallow roots, like lettuce, will be just fine in a wider pot. But other kinds of vegetables will need deeper pots for optimal growth. You may need to experiment until you find what’s right for you. Building materials. There’s more than one kind of pot (there’s even more than one kind of clay! ), and the material definitely makes a difference when it comes to your plants. Terracotta is pretty and traditional, but it’s often heavy and can break easily. Glazed ceramic gives you more color options, but they’re often bulky and difficult to move. Plastic is affordable and durable, but might not meet your stringent stylistic needs. And so on. Consider your options and make the best choice for you and your garden. Don’t let your plants get too thirsty! Container garden plants need more regular watering than your usual backyard variety because they tend to dry out faster. Pay attention to the look and feel of the leaves as well as suggestions for optimal amounts of water. Spreading the soil evenly can help prevent evaporation as well. Drainage is your friend. 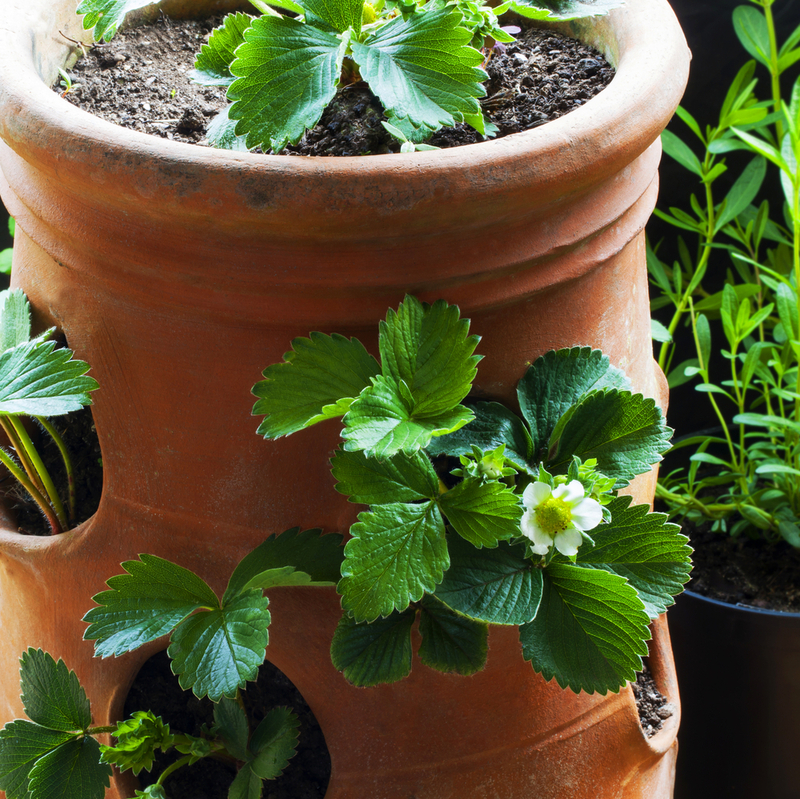 You’ll definitely want to use pots with drainage holes for your container garden. Roots left in water too long will rot, but you can easily avoid that by making sure the pot drains properly and you’re watering just enough—no more, no less. No sun? No problem! If your containers are relatively mobile, you can move your plants into and out of the sun as needed. A wheeled trolley is a great tool for this. 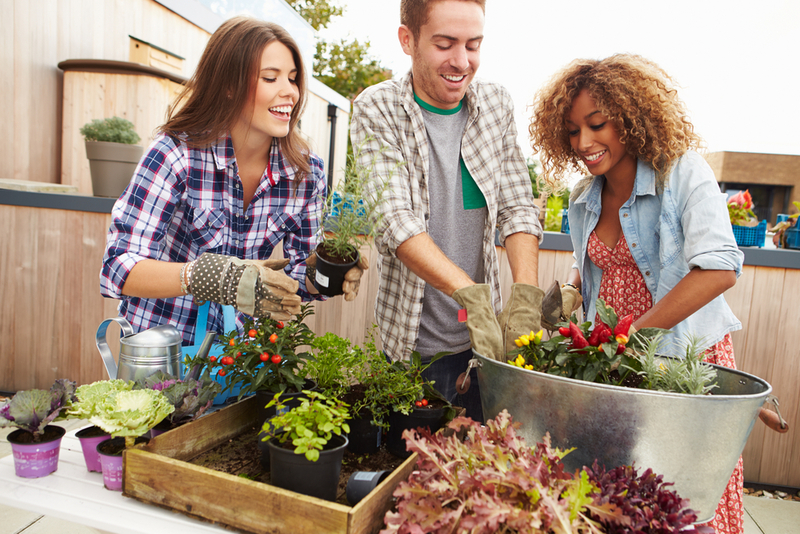 This is definitely an advantage over traditional backyard gardening! As you’re planning your growing needs for 2017, don’t forget the versatility of container gardening—specifically the container part. It’s not just about what plants you choose; the homes you give them can make or break your green thumb. Review your options and make 2017 your greenest year yet! Hummingbirds are among the most beautiful wild birds in North America. Some cultures even consider them an omen of happiness. On a more practical level, they eat insects like mosquitoes and, along with bees and butterflies, are pollinators crucial to the life cycle of plants and trees. 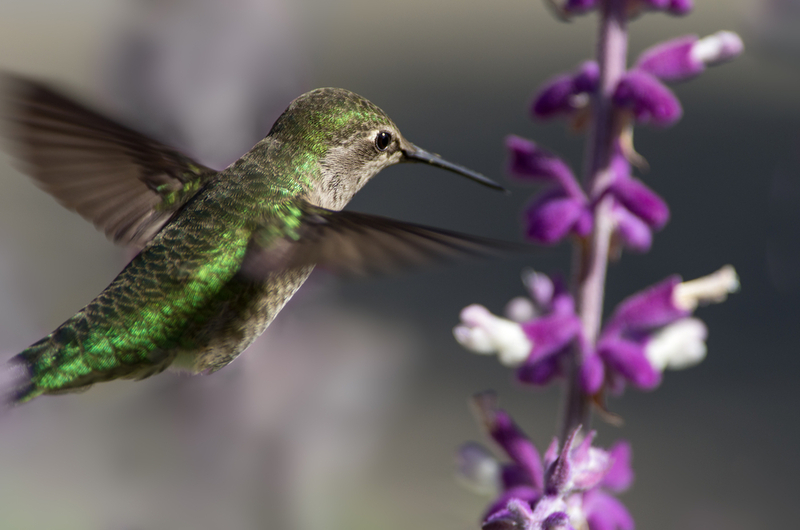 If you want to have a hummingbird-friendly garden, choose flowers that are not just attractive but that provide the nourishment hummingbirds need to support their extremely fast metabolisms. In addition to providing flowers for nutrition, provide them with resting space in the form of shrubs or trees, and ensure that fresh, clean water is available. When it comes to plants, hummingbirds’ long, slightly curved beaks are specially adapted to eat nectar from tube-shaped flowers like honeysuckle and lupine. Be sure that the plants you choose are not invasive—in fact, use native plants whenever possible—and that they’ll survive in your plant hardiness zone. Check the USDA’s Plant Hardiness Zone Map to find out what zone you live in, and get your flowers based on what will flourish in your area. Local garden nurseries and garden clubs can also be a good source of information about flowers that do well where you live. If you have pets that go into your garden area, be sure that what you’re planting will not be toxic to them. The ASPCA’s toxic and non-toxic plant list is a good place to start. Some of the hummingbird-friendly plants that should do well in your backyard garden include bee balm, begonia, lobelia, columbine, dahlia, delphinium, flowering tobacco (Nicotiana alata), geraniums, petunia, phlox, sweet William, verbena, and zinnia. As a bonus, many of these plants smell wonderful. If you’re looking for plants to hang in pots on your balcony, try fuchsia, phlox, begonia, nasturtium, petunia, scarlet sage, and hibiscus. Have you made a hummingbird-friendly garden on your balcony or in your backyard? Leave a comment and tell us what flowers you used. We have all seen kombucha at the store—the glass bottles filled with orange liquid advertising their probiotics and health benefits. But what actually is kombucha? Where did it come from? Kombucha has been used both as a delicious drink and a medicinal beverage since the late 1800s. There are many health benefits to eating or drinking fermented food—think cheese, yogurt, sour cream, or sauerkraut—although they are not appealing to some people. The rise of mass-produced food has led to a downfall in real and fermented foods in people’s diets. Kombucha is one way to add this back into a standard diet without too much change. Kombucha is a mixture of black tea and sugar that has had a symbiotic colony of bacteria and yeast (SCOBY) placed into it. The SCOBY is the culture of beneficial bacteria and yeast that will ferment the tea. It generally takes one to four weeks before the beverage reaches its best flavor, sweetness, and carbonation. This is a process that is quite easy to do in your own home. 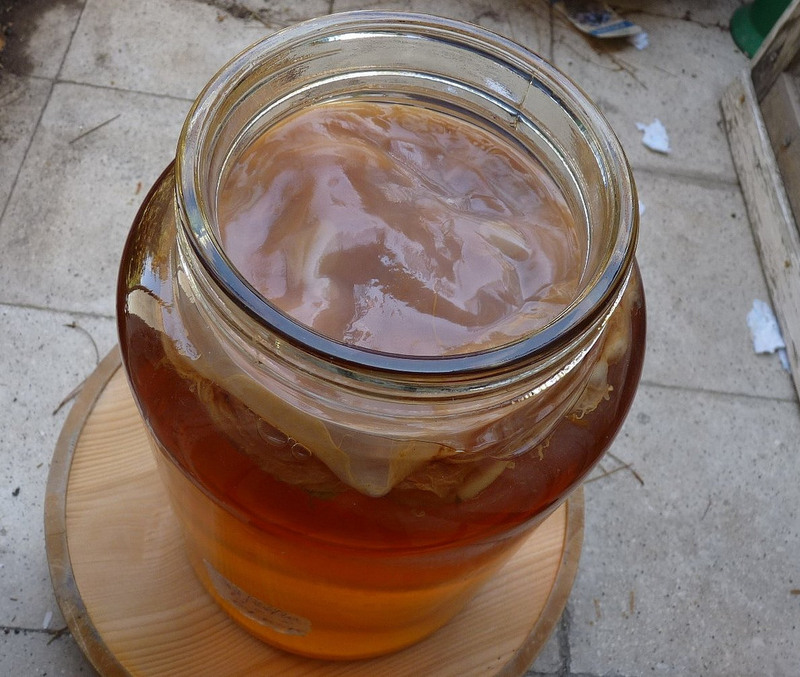 There are many theories about why the bacteria and yeast form this SCOBY, but the most plausible seems to be that it protects the fermenting tea from air and shields the kombucha from “unfriendly” bacteria. The benefits of incorporating kombucha into your diet are many. Not only is it anti-microbial, but it is full of antioxidants. This helps reduce inflammation. Kombucha has also been said to detoxify the organs, reduce constipation, and boost energy. The small amount of caffeine from the tea also proves beneficial as well. It’s a probiotic and it soothes the intestinal tract. The antioxidants reduce free radicals and aid in healthy cell regeneration. No matter what issues you are seeking to address, kombucha is both a simple and delicious addition the diet that can work miracles and also provide a fun in-home DIY project.